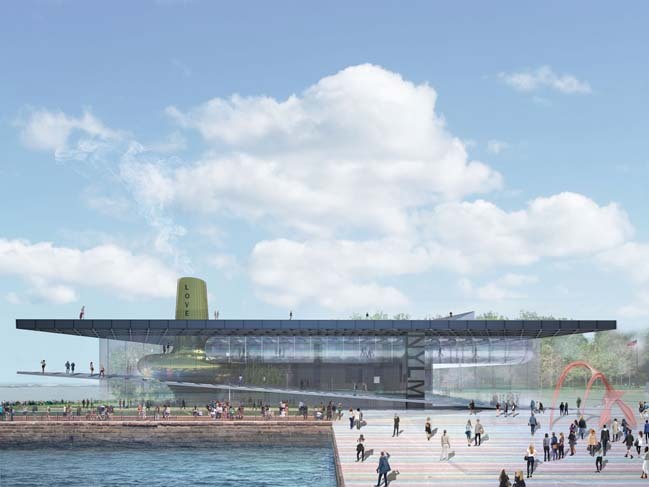 The young International architecture office zU-studio proposes a new triangle-structure for the New York Liberty Museum to create the right atmosphere to welcome visitors and to invite them to think and reflect about freedom. Project's description: FREEDOM is the ability to decide consciously, honestly, authentically and with integrity how we want to act in every moment, without being controlled or constrained by any other person or circumstance. Sometimes we can even become prisoners of our own thoughts and memories. Human beings experience freedom through three different channels: Body, Mind and Spirit. When we find the right balance between these three elements we are closer to awareness, consciousness and inner peace. These feelings are directly related to love, both individual love and collective love. Consciousness is an essential state for a human being to experience individual freedom. Compassion, comprehension, tolerance and respect are the necessary ingredients for humanity to develop as a society. 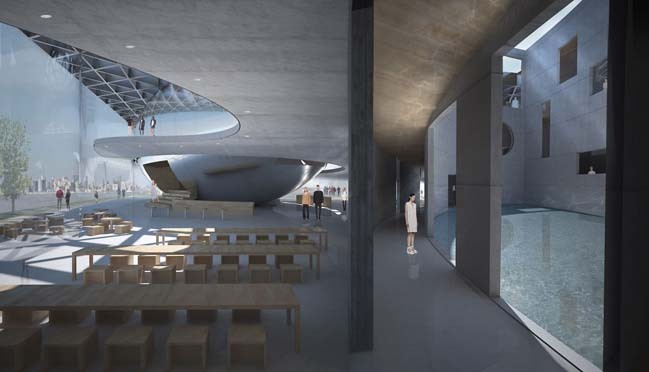 Our proposal aims to create the right atmosphere to welcome visitors and to invite them to think and reflect about freedom. How do they experience freedom, and how can they help build free communities in their own environment. The EQUILATERAL TRIANGLE is, in mathematics, the symbol of ideal proportions. In geometry, an equilateral triangle is a triangle in which all the three sides are equal. 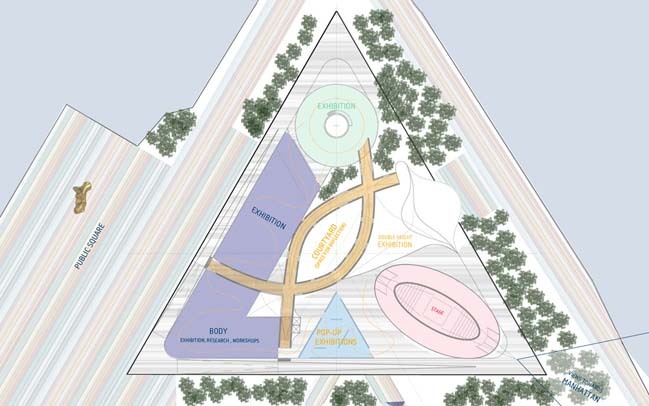 Sexuality, gender and race equality will be represented by the triangular building . TWO ARCS embrace as symbol of unity, compassion and engagement . 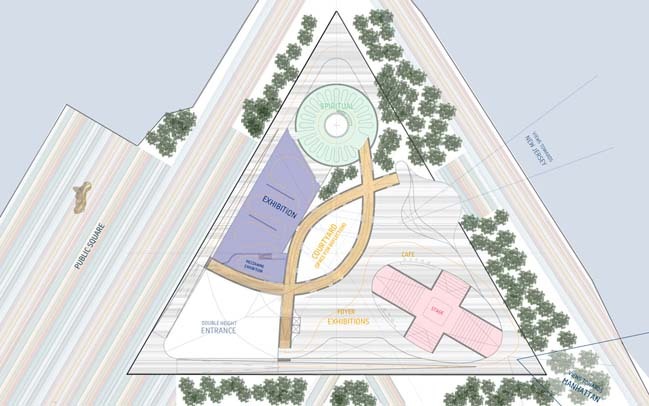 The main structure of the building will be established by these two arcs, which will connect the different parts of the program through the spiral ramps. 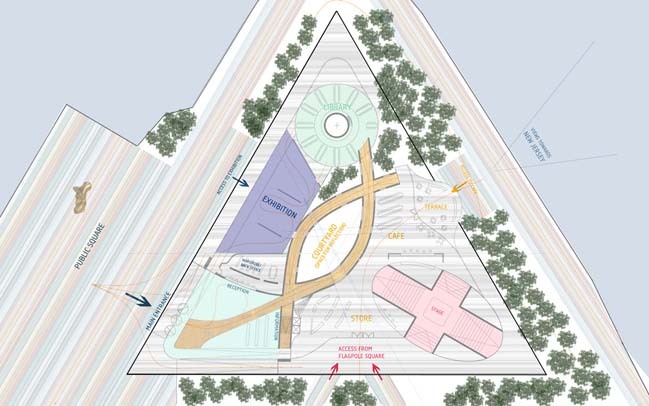 The space generated within the arcs will be the heart of the project: the awareness space, where the most impressive exhibitions and performances will take place. This is the place where all the visitors will be invited to think about the concept and the real meaning of freedom through the different activities. The program will be divided in three parts: Body, Mind, Spirit. The Body part will host workshops, exhibitions, lectures, yoga/meditation sessions, dancing lessons… It will invite people to explore and experiment with their bodies. The Mind part will create a space for discussion, debates, and expression of ideas and thoughts through different mediums . The Spirit part will create a peaceful, quiet space for people to connect with themselves on a deeper level. 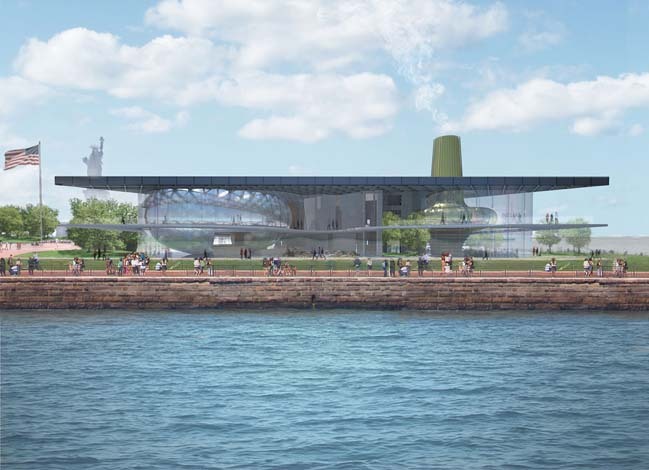 The idea of verticality will be represented through a big chimney that will emanate peace, love and respect rather than polluting substances . The program is spread into three different floors. The ground floor is open and transparent on all the three sides of the triangle. 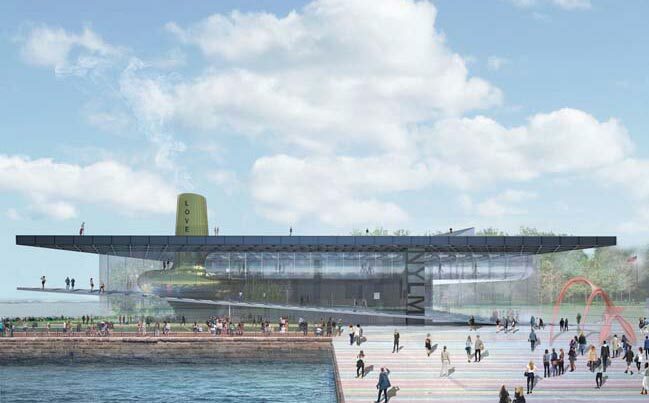 The Project proposes to create a public plaza to welcome visitors as they arrive to the Island by boat. The main entrance will be in the corner facing this new public square. The reception and an information point, a café with unique views of Manhattan, a shop and a library will complete the distribution of this floor. On the first and second floor, the program will include different exhibition spaces and an auditorium. 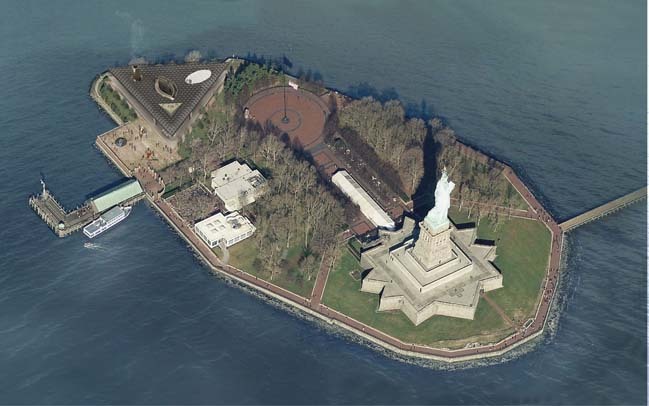 The rooftop will be open to the public and will be an important part of the building with impressive views of the Statue of Liberty , Manhattan and New Jersey. 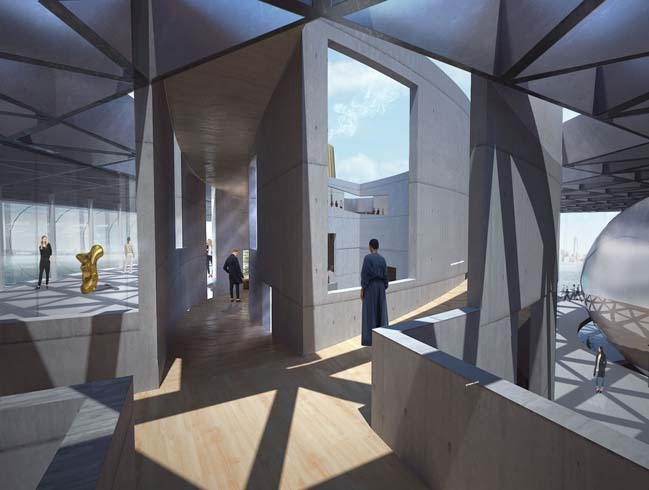 Moving through the building will be interesting because of the diversity of paths the visitor can take. 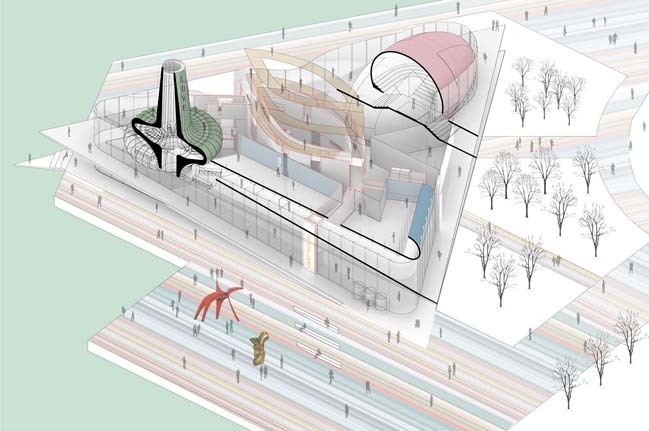 The central ramps will connect all the different spaces, but the spaces will be also connected through a perimetral route. The experience of the visitors will be well organized but at the same time completely unpredictable and full of surprises. People will discover new paths, new visuals, new relations between spaces as they walk through/around the building.